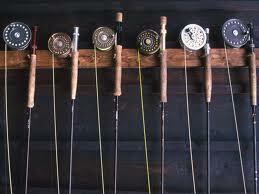 How far would you go NOT to lose your fly rod? Twice this past season, I’ve been in a fight to secure wayward pieces of my fly rod. In the Pacific Northwest, my son and I were pounding some fast-moving water and “slammo” half of my five-piece, 7 weight rod comes off and starts floating downstream. The water was deep, fast and chilly, a nasty situation at best. After quickly adding up how my that Sage cost, I managed — finally — to pull the sucker back in on the fly line! Dumb. Note to self: push down the sections harder next time before beginning to fish. Then last weekend, I had to climb up a mini-mountainside to get back to the trail. I stuck my three-piece, 3 weight in the deep back pocket of my vest, and zipped it, so I could use both hands to help leverage my large self up the hill. Because of the width and depth of the pocket, several inches of each piece protruded into the space behind my head. Feeling exhilarated by my solution, I muscled up the sliding San Gabriel sandstone, as it sporadically collapsed at an alarming rate. With my reaching fingers close to success, a low-hanging branch snatched two of the three pieces out of my zipped pocket! They fell and hung out of my grasp, held by a helpful (small) plant, ready to tumble all the way back down, some 50 feet. Mere noses from the trail, but not yet there, I s-t-r-e-t-c-h-e-d far enough to grab hold of them, and today my back tells me that although I rescued my fav Sage, I’m not as young as I once was. Dumb. Note to self: stop all heroics and take the easy way up and out. Got a “rescued my rod” story? Please post below. I think that we have all done similar at some time, it seems that modern carbon rods fair better if you give the ferrules a slight twist as you assemble them. Something that was always frowned upon when fishing cane in years gone by. Perhaps the most valuable tip is to NEVER carry a light rod assembled but not rigged. It is so easy to pull the tip section off in the branches of a tree whilst walking in or out from the river and never know, especially with the modern five and more piece outfits. You won’t find the tip section in the bushes if you do this. If you at least have the line rigged and a fly in the keeper ring you won’t lose the tip. Yes, the tip top! I remember once when my son was much younger, and we had a chance to fish for salmon outside Juneau, Alaska. Simply walking along a path, he lost his tip top and that was the end of his fishing day. Gotta love stringing up before you go!